People are often awestruck by the schemes which receive planning permission and feel powerless to influence decisions taken by distant committees. Poor development is waved through and little community benefit is offered in return. Now a group of local people in the Westminster part of Fitzrovia are working to resolve the problem, and raise the standard for developments that do go ahead. Fitzrovia West Neighbourhood Area. A Neighbourhood Plan can help shape development. Fitzrovia is a great place to live and work. It is a diverse community with interesting cafes, shops and offices. Residents and businesses, along with their staff, like being here. No wonder developers are taking an interest in what used to be considered a rather sleepy backwater, albeit in the centre of town. A great asset is its transport connections. Crossrail is due to open in 2018, Crossrail 2 is already planned and the lines will cross at Tottenham Court Road station, making it a major hub. And HS2 (if it goes ahead) will terminate at Euston and eventually run via Birmingham to Manchester and potentially further north. Three new transport lines are the primary reason that we are getting unprecedented pressure for development in our area right now. The area around Tottenham Court Road Crossrail station is designated as an “opportunity area” by the Greater London Authority (GLA). Development here is inevitable, and many sites like the former Royal Mail Delivery Centre at the bottom of Rathbone Place and Newman Street have already been given planning permission. 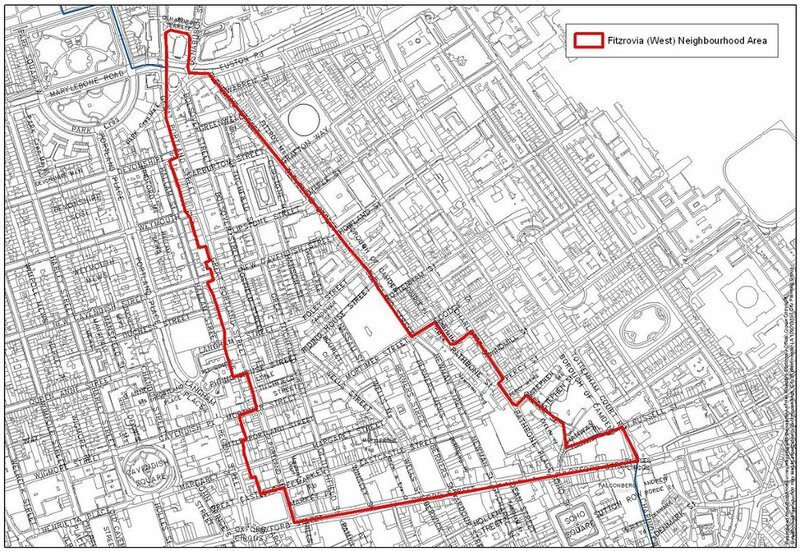 But the Opportunity Area represents only a fraction of Fitzrovia West, and development in the rest of our neighbourhood can be shaped by a plan which a group of residents and business people are currently working on. Our job will be to identify potential sites within FitzWest and evaluate them for ourselves, weighing up the pros and cons: How high should these new buildings go? What uses should they have? How can we integrate affordable housing into such a high value area? How sustainable should development be? As well as considering architecture and function, we will be considering issues like parking, deliveries, waste and emissions from boilers and air-conditioning. 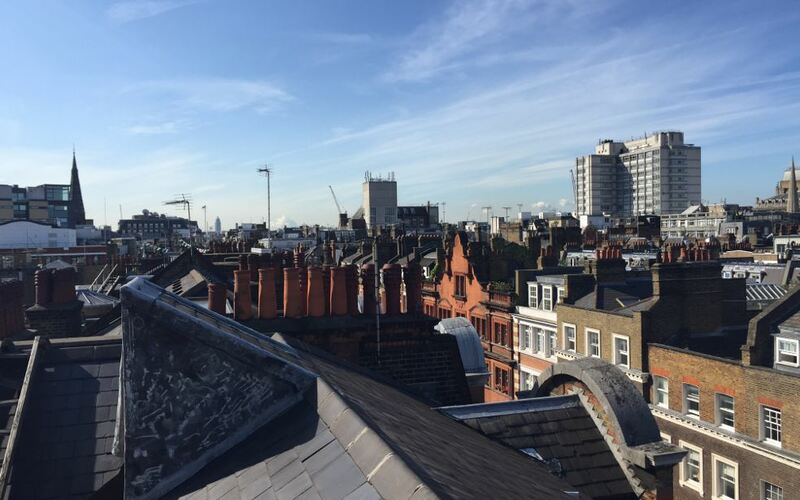 View of the rooftops looking south along Great Titchfield Street. The spires of All Souls and All Saints churches are both visible, framing the view. A high buildings strategy would guide where tall buildings could be built. Photo: Wendy Shillam. Consider the question of height. There is no high buildings strategy for Fitzrovia, yet high building planning applications are commonplace these days. There are some parts of our area where high buildings are definitely out. Parts of FitzWest happen to be in the line of sight between Primrose and Parliament Hills and the Palace of Westminster. That means that in some locations high buildings cannot be built because they would interrupt these important views. In addition, within the East Marylebone Conservation Area around Great Titchfield Street, the traditional roofline is very consistent. We plan to publish policies about high buildings suggesting where they are and are not appropriate, and take into account the overshadowing of existing residential blocks which, until now, Westminster City Council have been unwilling to consider as important. From later this year most new development will bring with it a payment to the GLA and the City Council called the Community Infrastructure Levy (CIL). The Authorities are duty bound to consult with the Neighbourhood Forum to establish a local agenda to agree how to expend this levy. For example, CIL money could be spent on improved rubbish disposal systems, better green infrastructure, more cycling facilities and more electric vehicle charging points. Once the Neighbourhood Plan is published it will go to a local referendum. If this is agreed, we will be a much stronger community, with the authorities taking note of our wishes. The National Planning Policy Framework (NPPF), a government policy document that sets out how neighbourhood planning will work, makes it very clear that “the policies it contains take precedence over existing non-strategic policies in the [Local Authority] Local Plan for that neighbourhood”. It is true that we can’t stop growth. We can’t go against national, London-wide or Westminster Council strategic policy. But we can work with all of the policy makers, on behalf of the community, to make sure that growth is managed. Development can bring benefits to everyone who lives, works or visits our area. The FitzWest Neighbourhood Plan aims to ensure that this will happen. Wendy Shillam is chair of the Fitzrovia West (FitzWest) Neighbourhood Forum. Help draft the Fitzrovia West Neighbourhood Plan. Membership of the Forum is free and open to anyone who lives, works or runs a business or organisation within the area. Go to fitzwest.org/wordpress/ to find out more and comment on proposals. Sign up for the FitzWest newsletter for news of public meetings and events throughout the plan making period.